. . . .because if it was, this woman would have a gazillion supplicants swarming to her Cumbrian home. It’s an amazing print of a tawny owl (Strix aluco)! A woman returned to her Cumbrian home to find a near perfect imprint of an owl on her window. The bird had apparently crashed into the window of Sally Arnold’s Kendal home, leaving the bizarre image – complete with eyes, beak and feathers. Experts said the silhouette was left by the bird’s “powder down” – a substance protecting growing feathers. . . 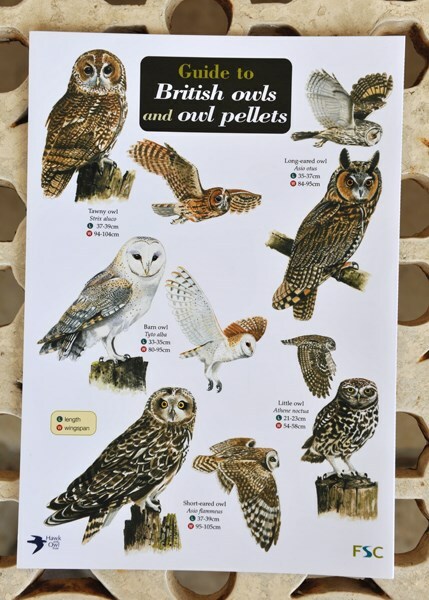 Experts from the Royal Society for the Protection of Birds (RSPB) confirmed the bird was most likely a tawny owl because of its size and shape and the fact that they appear in gardens more regularly than others. Val Osborne, head of the RSPB’s wildlife inquiries team, said: “We don’t very often see an imprint of a bird that’s flown into a window that’s this clear and where it’s pretty obvious exactly what kind of bird it is. This entry was written by whyevolutionistrue and posted on July 11, 2011 at 1:04 pm and filed under animals. Bookmark the permalink. Follow any comments here with the RSS feed for this post. Both comments and trackbacks are currently closed. What do you mean an owl?! It’s clearly Jesus!! Nonsense. That’s clearly Ceiling Cat! Come on people. It’s Owl Jesus. Nah. Owls are birds of prey, right? Only, in this case, it’s a descendent of the progenitor of birds of pray. Rawr. Two clicks away, pet Jesus. Let’s all peer pressure JC into using this image in some future combined post about cats and theology. A pigeon once crashed into my “patio door”/picture window and left a similarly strong imprint. Sadly, it didn’t survive, and I only hope that its subsequent flopping around was unconscious. If anyone has any ideas on what can be done to prevent birds crashing into my windows (it often happens) I’d be grateful. Thanks, palefury. I wonder, though. Do they actually work? The problem is that my new windows are so brilliantly reflective that any bird would suppose that my window is just more garden, pretty artificial butterflies notwithstanding. Also, the picture window is basically a wall, so it’s enormous. Dunno. Ask the parakeet, or the owl, or the pigeon, or various sparrows. They just do it. Maybe they expect the other bird to behave normally and get out of the way. Seriously, I imagine that angles and reflection have something to do with it. At any rate, they definitely get confused, often fatally, alas. It’s possible that their angle of flight relative to the sun is such that they don’t see their own reflection, at least, not until too late. Perhaps even if they do see their reflection at first (“some other bird” at apparently twice the distance between themselves and the window) they lose sight of it as they move into the shadow of the house. But I’m just guessing. I was sitting outside a hotel in Houston with almost-mirrored shiny windows, and watched some kind of blackbird-sized passerine repeatedly attack its reflection in the glass. For about 20 minutes. It would fly at its rival, hit the glass, fall back to its perch (apparently a bit shaken but not seriously hurt), and then do it all again. Several years ago I had a robin do that every morning for several weeks, at about 4-5 am on my bedroom window. Not a pleasant way to wake up every morning. I found out that they see their own reflection and think it is another bird. they fly at it to scare it away from its territory. The do this repeatedly, but they fly into it with their chest and wings, not their heads, so they don’t (seriously) hurt themselves. I seem to remember a recent WEIT article on how (some) birds may not see in front during flight, say when looking for food. Isn’t it called “open” air for a reason? You can buy silhouettes of an owl, a hawk, or a falcon to stick up on your window. You can probably find them at a store that carries bird feeding supplies. OK, James, thanks. I’ll look for them. Maybe a bird of prey is just the thing! Buy ? What an age we live in ! Roll up your sleeves & get bright plastic film, scissors, bottle of wine to aid the muse..
James is right. You haven’t seen my artwork. We just leave our vertical blinds partly closed. This seems to keep our garden birds from crashing into the windows. But the silhouettes work well, too. I just didn’t want to freak out our bird visitors by threatening them with falcon shapes all the time. Yes. I usually keep the curtains closed, partly for that reason, partly because of the summer sun. Birds still hit the window, though. I was wondering about the terror-factor involved in using a hawk, too, but maybe it’s better scared than dead, or crippled. I think first I might try hanging something distracting, like ribbons. I’ve tried something similar before but it was distracting to me and my students. Still, I might find a better way to do it. On a solemn note…just because the body wasn’t found doesn’t mean the owl survived…. Yep, I unfortunately probably hit an owl once with the upper corner of my windshield one night on a very dark Interstate. I saw a split-second image of what seemed like a big bird in the corner of the glass and then it was gone. There wasn’t any point in going back because, after processing the whole thing, dark as it was, I’d never be able to figure where I was vs. the relatively featureless countryside. Yeah, that’s what I thought, too. I’ve buried a lot of birds that left much less of a mark on the window than that owl did. For a little while, I had the good fortune to share office space with an orphaned baby owl who was being fostered by one our employees. I never did get used to the instant appearance of the owl, with no notice and without producing any flight sounds. It really was. The owl would just . . . appear, silently, on the bookcase, where he stayed–blinking, blinking–until some unknown thing called him away. I should probably know better than to argue with Experts from the Royal Society for the Protection of Birds, but look at those ear-tufts! Those and the wing shape make me think Long-Eared, not Tawny. They’re about the same size. I think we should keep this whole thing quiet. It could start some kind of cottage art industry for bird imprints. She’s probably on the phone right now taking offers for her window. Somebody guard the plexiglass aisle at the local hardware store. Anybody ever seen Charles Darwin’s face on their toast (http://tinyurl.com/6ze7vch)? Phil Plait, the Bad Astronomer, once posted a picture of condensation on his shower curtain that looked like the face of Vladimir Ulyanov (aka Lenin). The only thing worse than a pre-Cambrian rabbit is a Cumbrian owl. I wouldn’t be too sure about that…after all, it’s the Cumbrian owls that ate all the pre-Cambrian rabbits, thereby sparing us the ignominy of having to explain them to the Creationists…. Looks more like an ewok. Looks like someone didn’t get their letter from Hogwarts.